After 10 years of use, most floors would only be fit for the skip. With Ecotile, Halfords not only received money for their old floor but also was pleased to know that the old floor would be recycled. Usually, when something comes to the end of its useful life there is a slight guilt that what you purchased is now going to be scrapped and your money will never be seen again. With Ecotile interlocking floor tiles, this is not the case. Unlike any other type of flooring we know of, Ecotiles are quickly lifted and reused in a new location. If you discontinue your application, or you would like to upgrade your flooring, Ecotile can help you remove and recycle your product. Not only is this trouble free, we also pay you for your old tiles. You can even use the money we pay you to contribute to a new floor! This is exactly what happened when Halfords closed their distribution centre in Redditch. Back in 2001, Halfords needed to install a new covering over their mezzanine floors as the existing chipboard was a victim of excessive wear. Ecotile was laid directly over the old floor which protected the chipboard from further damage and created a clean finish. 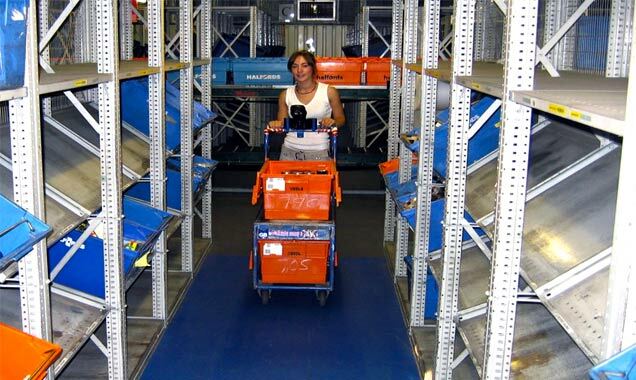 In 2011 as part of a major restructuring, Halfords decided to close the distribution centre and Chris Hurlaston, the facilities manager was tasked with decommissioning the site. Chris contacted us to see if we could help with removing the floor and requested a quote for what the job was cost. He was very pleasantly surprised to find out that it would not cost a penny and that in fact we would pay Halfords for the old tiles. We lifted the floor, packed it onto pallets and returned the tiles to our factory. We then reprocessed them and used them to create our recycled range of Ecotile, which are particularly popular for domestic garage applications. Halfords commented that Ecotile had not only provided an excellent floor for over 10 years, but also fantastic value. They were over the moon that they got money back at the end of the floor’s life and we provided the peace of mind that the old flooring would not end up in land fill.